A small step in the good direction. who will ensure that no truth will never never threaten the so carfully built up alternative realities that were designed by our opinion providers and deciders. Fantastic so far! But in the long run, what does it really mean for both Peter and for academic freedom in OZ? I think those questions have yet to answered. I would not be surprised if in the future we will see Peter have to go to the G0-fund-me till to continue the fight on appeal. I don’t see where James Cook has much choice but to try and appeal this ruling. 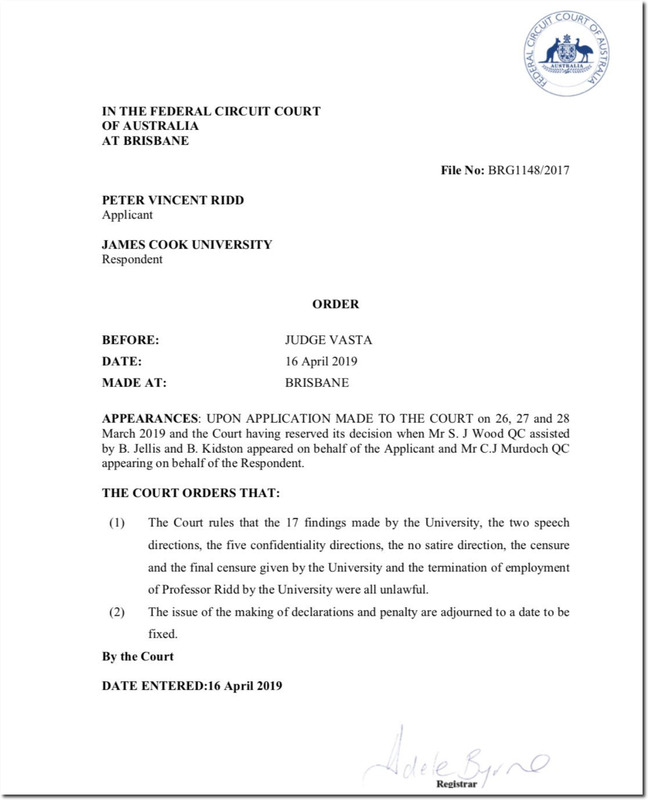 That being said, I can’t help but notice how quickly an initial judgment has been made in Peter’s case as compared to the lack of action in Steyn v Mann in our own legal system. If our system move much slower we will need to invent something like the Geologic time scale as a metric for it because generations will die out before a case is finally adjudicated. The problems arise when the left appoints judges that don’t really respect the Rule of Law. To leftist judges it’s the laws that are on trial, not the criminals. Even a dying man can show glints of life up till the end. Wait for the onslaught of violent street protesters trying to get the ruling overturned by ‘alternative’ or ‘direct’ action . . .